Lately it seems that each day brings a new national food day that we are told we must celebrate, be it national sausage day, cheese week or the more obscure national chocolate covered cherry day (January 3rd if your interested). If you do not like being told to eat your chocolate cherries on one particular day then there is a lengthier period of time to enjoy your food coming up, Sourdough September. The Real Bread Company started Sourdough September in 2012, their aim is to get people to try, buy or make their own sourdough with various activities and events throughout the month. Sourdough is the oldest way to create bread and it tastes very different from your average loaf. I have tried to make my own sourdough loaf a few times before but had never managed to get past the sourdough starter stage. There is a family history of bread making in my family, on both maternal and paternal sides. 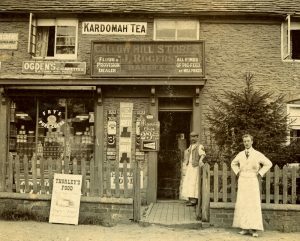 My great great grandfather, Joseph Rogers, ran his own bakery in Bewdley, Worcestershire around the 1900’s. So this lack of any movement in the sourdough starter must be making my ancestors cringe. 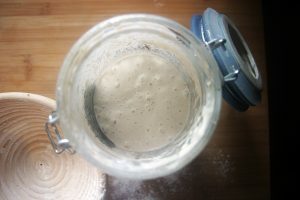 The starter is the process of cultivating the wild yeast that is present in the flour and can take several days to create. With my previous attempts I had never got past this stage and no matter how much Paul Hollywood was telling me it was a simple process in his book, I couldn’t get the starter to… well start. A few weeks ago I decided to try again and to my surprise the starter looked like it was working, bubbles were appearing in the starter and it was rising. It was actually working a little too well, so much so that it poured out over the container onto the shelf, down the wall and across the floor. A handy tip, if you want to try and make a sourdough starter, make sure your container is big enough to allow it to rise! The actual process of creating the sourdough is a lot longer then normal bread, the first prove took 4-5hours and the second prove 8 hours, but it is worth the wait and I will choose this way of making bread from now on. You can feed your starter after each use and this will keep it going indefinitely, the oldest sourdough starter is claimed to be over 120 years old. If you want to try sourdough without making it yourself then Red Dog Bakery in Torrington have an excellent selection.